Whole cauliflower topped with a mushroom and butternut squash stuffing in pastry. 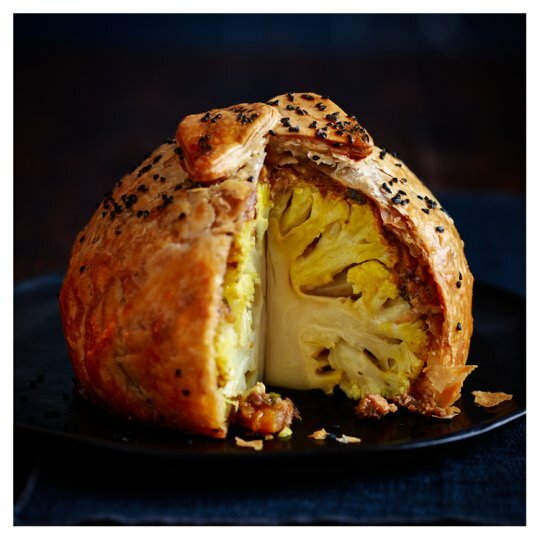 Turmeric spiced whole cauliflower with a mushroom and butternut squash duxelle wrapped in golden puff pastry. This product is part of the Tesco Festive Food to Order range. So that we can get this product to you in time for your delivery or collection slot, please ensure that you have checked out by 23:45 on the 14th December. Beyond this date, the Festive Food to Order products cannot be amended, but non Festive Food to order products can still be amended. INGREDIENTS: Cauliflower (35%), Mushroom and Butternut Squash Stuffing (34%) [Water, Mushroom, Butternut Squash, Onion, Wheat Flour [Wheat Flour, Calcium Carbonate, Iron, Niacin, Thiamin], Red Wine, Extra Virgin Olive Oil, Red Wine Vinegar, Muscovado Sugar, Salt, Orange Zest, Thyme, Yeast, Sugar, Wheat Gluten, Black Pepper, Cinnamon, Clove, Nutmeg], Puff Pastry [Wheat Flour [Wheat Flour, Calcium Carbonate, Iron, Niacin, Thiamin], Water, Rapeseed Oil, Palm Oil, Salt, Preservative (Potassium Sorbate)], Rapeseed Oil, Parsley, Water, Kalonji Seeds, Turmeric. Instructions: 190°C / Fan 180°C / Gas 4 40-60 mins Remove lid and lift out wellington on ovenable card tray, discard plastic base tray and lid. Place on a baking tray and brush with little beaten egg or milk. Please note if pastry is brushed with egg or milk for a golden glaze then the product is no longer a vegan product Place in the centre of a pre-heated oven for 40-60 minutes until the pastry is golden brown. Rotate tray halfway through cooking. Leave to stand for 1 minute. Remove from ovenable cardboard tray and serve. Instructions: Not suitable for oven cooking from frozen. Please note if pastry is brushed with egg or milk for a golden glaze then the product is no longer a vegan product.Caution: Contains alcohol..